(Vatican Radio) Pope Francis met on Friday with the College of Cardinals in the Clementine Hall. It was his first meeting with the full College of Cardinals. On Thursday evening, he celebrated Mass ending the Conclave with the Cardinals under 80 who participated in the election of the Pope. This morning, Pope Francis met with the Cardinals in the Sala Clementina. VATICAN CITY – Pope Francis paid a heartfelt tribute Friday to his predecessor Benedict XVI, saying his faith and teaching had "enriched and invigorated" the Catholic Church and would remain its spiritual patrimony forever. (Vatican Radio) The Holy See Press Office held a briefing on Friday afternoon, where the Director, Father Federico Lombardi, SJ, continued to provide as much information as possible about Pope Francis, and his activities. Summaries were given of the Pope’s homily on Thursday evening and speech to the cardinals on Friday morning. More details on the way Pope Francis is living the papacy emerged: At the Domus Santa Marta, the Pope just sits where there is a place available in the dining hall. He concelebrated Mass in the Domus Santa Marta Friday morning with several of the Cardinals, and he gave a homily without a prepared text. It was confirmed that on Wednesday evening, Pope Francis called the Apostolic Nuncio in Argentina to tell him to tell the people of the country not to come to the Installation Mass, and to use the money to help the poor. The Nuncio also informed Father Lombardi that many people of Argentina are going to confession for the first time in many years. The Vatican has denied that Pope Francis failed to speak out against human rights abuses during military rule in his native Argentina. "There has never been a credible, concrete accusation against him," said Vatican spokesman Federico Lombardi, adding he had never been charged. The spokesman blamed the accusations on "anti-clerical left-wing elements that are used to attack the Church". 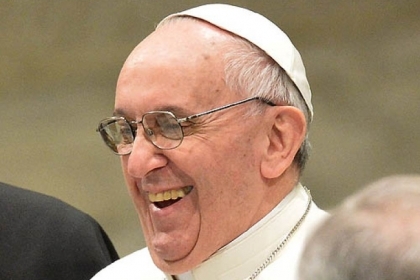 Jorge Bergoglio, now Pope Francis, led Argentina's Jesuits under the junta. Correspondents say that like other Latin American churchmen of the time, he had to contend, on the one hand, with a repressive right-wing regime and, on the other, a wing of his Church leaning towards political activism on the left. One allegation concerns the abduction in 1976 of two Jesuits by Argentina's military government, suspicious of their work among slum-dwellers. At the beginning of my ministry in the See of Peter, I am pleased to meet all of you who have worked here in Rome throughout this intense period which began with the unexpected announcement made by my venerable Predecessor Benedict XVI on 11 February last. To each of you I offer a cordial greeting. The role of the mass media has expanded immensely in these years, so much so that they are an essential means of informing the world about the events of contemporary history. I would like, then, to thank you in a special way for the professional coverage which you provided during these days – you really worked, didn’t you? – when the eyes of the whole world, and not just those of Catholics, were turned to the Eternal City and particularly to this place which has as its heart the tomb of Saint Peter. Over the past few weeks, you have had to provide information about the Holy See and about the Church, her rituals and traditions, her faith and above all the role of the Pope and his ministry. I am particularly grateful to those who viewed and presented these events of the Church’s history in a way which was sensitive to the right context in which they need to be read, namely that of faith. Historical events almost always demand a nuanced interpretation which at times can also take into account the dimension of faith. Ecclesial events are certainly no more intricate than political or economic events! But they do have one particular underlying feature: they follow a pattern which does not readily correspond to the “worldly” categories which we are accustomed to use, and so it is not easy to interpret and communicate them to a wider and more varied public. The Church is certainly a human and historical institution with all that that entails, yet her nature is not essentially political but spiritual: the Church is the People of God, the Holy People of God making its way to encounter Jesus Christ. Only from this perspective can a satisfactory account be given of the Church’s life and activity. Pope Francis will visit his predecessor at the papal retreat at Castel Gandolfo next Saturday in a historic encounter that brings together the new pope and the first pope to resign in six centuries, the Vatican said in an announcement that outlines the church rites and political meetings for the first days of the papacy. Among the talks, the Vatican said Saturday, will be a session with the president of Francis' homeland Argentina on Monday, the eve of his formal installation as pontiff. The pope has sharply criticized Christina Fernandez her support for liberal measures such as gay marriage and free contraceptives. Pope Francis addresses a private audience with members of the media at the Paul VI hall at the Vatican on Saturday. The pope called for "a poor Church for the poor," saying he chose his papal name because St Francis of Assisi was "a man of poverty and a man of peace." Thank-you Klaas for the full written directions to posting photos! Pope Francis held his first Sunday mass at the intimate Church of St. Anna, which is reserved for Vatican employees. Afterwards, he surprised onlookers packed outside by walking over and shaking hands with them. 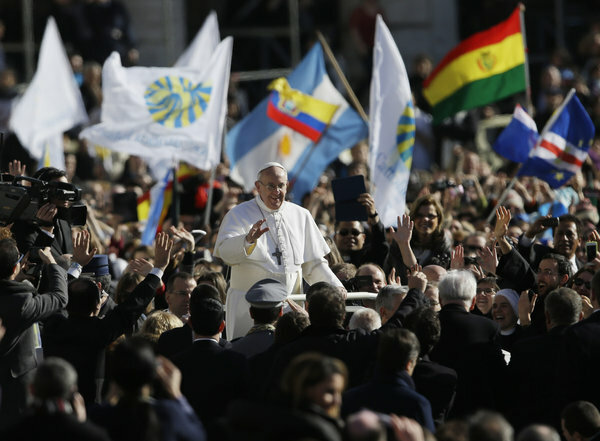 Thousands of Catholics waving flags from around the world packed St. Peter's Square on Sunday to hear Pope Francis deliver his inaugural Angelus. The new pontiff gave his Angelus, or noon blessing, from the papal apartment window, speaking to more than 200,000 worshippers in the square four days after his election as pope. "The Lord never tires of forgiving. We are the ones who tire of asking forgiveness." (Vatican Radio ) Pope Francis has chosen the motto "Miserando atque eligendo", meaning lowly but chosen; literally in Latin 'by having mercy, by chosing him'. A motto the Pope had already chosen as Bishop. One taken from the homilies of the Venerable Bede on Saint Matthew's Gospel relating to his vocation:"Jesus saw the tax collector and by having mercy chose him as an Apostle saying to him : Follow me." Beyond the motto the coat of arms has a blue field and is surmounted by the mitre and the papal keys. On the crest itself is at the centre is the symbol of the Jesuits, a flaming sun with the three letters recalling the name and the salvific mission of Jesus. Underneath we have two more symbols: to the right the star representing Mary and to the left the nard flower representing Joseph. AFP - Pope Francis has eschewed tradition and chosen a silver Fisherman's Ring rather than a gold one -- and one designed decades ago rather than created specifically for him, the Vatican said Monday. The gold-plated silver ring, one of the papal symbols that the new pope will receive during the inauguration mass on Tuesday, is modelled on a ring designed by Italian sculptor Enrico Manfrini, who died in 2004, for Paul VI. "The ring is designed by Manfrini, who created several religious works and it was presented to the pope by the master of ceremonies who had received the model from one of Paul VI's secretaries," said Vatican spokesman Federico Lombardi. Nicknamed "the popes' sculptor", Manfrini designed religious objects for several pontiffs, including Pius XII, Paul VI and John Paul II. The simple ring, customarily worn on the pontiff's right hand, depicts a bearded and haloed St Peter holding a pair of keys -- an emblem of the papacy which captures the moment Peter was given the keys to heaven. Vatican City, Mar 18 (EFE).- Pope Francis I received his countrywoman, Argentine President Cristina Fernandez, on Monday for a private audience, the Vatican spokesman said. The pontiff and his guest had lunch following the 20-minute meeting, Federico Lombardi said. Cristina Fernandez is the first head of state received by the former Cardinal Jorge Mario Bergoglio since he became pope last week. The pontiff intended the meeting as a "gesture of courtesy and affection" toward the president and the Argentine people, Lombardi told Efe. It was not a formal visit, the spokesman emphasized. VATICAN CITY (AP) — Argentine President Cristina Fernandez says she has asked Pope Francis to help defuse the long-running dispute between Argentina and Britain over the Falkland Islands. Fernandez told journalists after she met with the new, Argentine-born pope Monday at the Vatican that she has asked for his intercession to "facilitate dialogue" over the islands, which Argentina claims and calls the Malvinas. Just last week, British Prime Minister David Cameron said he doesn't agree with Francis' views on the Falklands. When Francis was archbishop of Buenos Aires, he had been quoted as saying that Britain "usurped" the remote islands. Vatican Radio) An historic first will grace the mass, March 19, that will inaugurate the pontificate of Pope Francis . After nearly 1,000 years, the Ecumenical Patriarch of Constantinople will attend the inauguration of the Pope of Rome. Delegates from more than 20 Christian churches and ecumenical organizations announced their attendance. However, the presence of His Holiness Bartholomew I is of historic significance. Considered “first among equals” in the Eastern Orthodox Communion, the Patriarch of Constantinople has not attended the installation of a Pope of Rome in more than 950 years, since Constantinople split from Rome in 1054. Fr. James Puglisi, who is the Minister-General of the Franciscan Friars of the Atonement and director of an ecumenical centre in Rome, called Centro Pro Unione, says the participation of Bartholomew I sends a strong signal in favour of ecumenical dialogue. “First of all, it’s a recognition of two local churches, the Church of Rome and the Church of Constantinople, which has ecclesiological significance. And the second reason is that the Metropolitan of Pergoman, John Zizioulas, who is the co-chair of the Orthodox-Catholic dialogue, is going to accompany him,” he said. (Vatican Radio) On Tuesday, March 19 – the Feast of Saint Joseph, spouse of the Blessed Virgin Mary and Patron of the Universal Church – Pope Francis will take part in a solemn Mass that will mark the formal inauguration of his Petrine Ministry. Hundreds of thousands of pilgrims and visitors are expected to fill Saint Peter’s Square for the liturgy, which is open to all the faithful. Tickets are not required for the Mass, which begins at 9:30 Rome time. The faithful throughout the world will be able to take part in the Mass via radio, television, and the so-called new means of communication. Vatican Radio will be broadcasting the liturgy on our website at rv.va. As part of the celebration, Pope Francis will also be greeting the official delegations of religious and political leaders who will be present for the inauguration. All the Cardinals in Rome are expected to be present for the Mass, and Archbishops and Bishops will be in attendance representing particular local Churches from around the world. Among the world leaders expected for the Mass are Argentine President Cristina Kirchner; Dilma Roussef, the President of Brazil; and Mexican President Enrique Peña Nieto. U.S. Vice President Joe Biden will also be in attendance, as will the Governor General of Canada, David Johnston. European leaders will be present at the inauguration, including German Chancellor Angela Merkel, French Prime Minister Jean-Marc Ayrault and Spanish Prime-Minister Mariano Rajoy. The President of the European Council, Hermann Van Rompuy, and the President of the European Commission, José Manuel Barroso will also be in attendance. Pope Francis became the Bishop of Rome and visible head of the Catholic Church immediately upon accepting his election to the pontificate last Wednesday evening. Tuesday’s Mass will mark the solemn public beginning of his Ministry as the 265th Successor of Saint Peter. Tomorrow, March 19, 2013—the Solemnity of Saint Joseph, Spouse of the Blessed Virgin Mary—Pope Francis will celebrate the Mass of Inauguration for his pontificate. The Mass, held in Saint Peter's Basilica, is scheduled to begin at 9:30 A.M. Rome time (4:30 A.M. EDT/3:30 A.M. CDT/2:30 A.M. MDT/1:30 A.M. PDT). Most networks will begin their coverage an hour earlier. Fr. Federico Lombardi, S.J., director of the Press Office of the Holy See, estimates that the Mass "will not last much more than two hours." Before the Mass, from approximately 8:45 until 9:15, the Holy Father will greet the crowd assembled in Saint Peter's Square from either the Popemobile or a Jeep. The Mass will be concelebrated by all of the cardinals still present in Rome, the patriarchs and major Eastern Rite bishops, and the superiors general of the Order of Friars Minor (Franciscans) and the Jesuits—a total of about 180 concelebrants. Around 250 bishops and archbishops are expected to attend the Mass. Before the Mass begins, Pope Francis will visit the tomb of Saint Peter, under the high altar of the basilica, where the papal pallium and the fisherman's ring, the symbols of his office, as well as the Book of the Gospels that will be used in the Mass, were placed this evening. He will then process to the steps of Saint Peter's, while the Litany of the Saints (with the addition of the names of all canonized popes) is chanted. On the steps of Saint Peter's, the Holy Father will have the pallium placed on his shoulders (as a symbol of the Good Shepherd, who places the lost sheep on his shoulder) and the ring placed on his finger, and then receive an act of obedience from six cardinals, representing all of the cardinals of the world. While these elements of the ceremony before the Mass will be accompanied by music reflecting the inauguration of Pope Francis's Petrine ministry, the Mass itself will be the Mass for the Solemnity of Saint Joseph. Father Lombardi notes that Pope Francis's homily will be a mixture of prepared text and extemporaneous preaching; it will likely focus primarily on the readings for the feast. The two elements of the Mass that will be specific to the inauguration of the Petrine ministry will be the offertory music, a motet "Tu es pastor ovium" ("You Are the Shepherd of the Sheep") composed by Palestrina for the inauguration of a pontificate, and a Te Deum at the end of Mass. The Mass will be conducted in Latin, with readings in English, Italian, and Spanish, while the Gospel will be chanted in Greek "to show that the universal Church is made up of the great traditions of the East and the West." The universal nature of the Church will also be evident from the presence of Bartholomew I, the Orthodox Ecumenical Patriarch of Constantinople. It will be the first time since the Great Schism of 1054 that the Ecumenical Patriarch has been present at the inauguration Mass of the Pope of Rome. Vatican City, Mar 18, 2013 / 04:45 am (CNA/EWTN News).- All the Vatican officials will continue in their positions “until otherwise provided” while Pope Francis takes time for “reflection, prayer and dialogue before making any definitive appointments,” but one can expect changes to happen. Usually, when a new Pope begins his ministry, he confirms all the heads of the congregations and pontifical councils, who lost their posts at the beginning of the sede vacante period. He also reconfirms the five-year terms for the secretaries of the Vatican departments – who took over the management of the offices while there was no Pope. When he issued the normal confirmation on March 16, Pope Francis only offered a two-sentence statement, and nothing is mentioned about the Vatican Secretariat of State, the second most powerful congregation. VATICAN CITY — At the formal start of his papacy, Pope Francis offered a passionate pledge on Tuesday to serve “the poorest, the weakest, the least important,” striking the same tones of humility as have marked the days since he was elected last week. Page created in 10.244 seconds with 19 queries.